The following diagram gives the formula for the Pythagorean Theorem, scroll down the page for more examples and solutions that use the Pythagorean Theorem. A right triangle consists of two sides called the legs and one side called the hypotenuse. The hypotenuse is the longest side and is opposite the right angle. The Pythagorean Theorem or Pythagoras' Theorem is a formula relating the lengths of the three sides of a right triangle. In any right triangle, the sum of the squared lengths of the two legs is equal to the squared length of the hypotenuse. 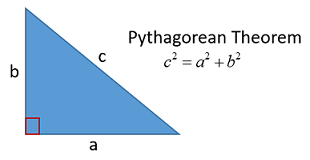 How to solve application problems using the Pythagorean Theorem? The Pythagorean Theorem states that in a right triangle, the square of the hypotenuse is equal to the sum of the squares of the other two sides called the legs. This proof is based on the proportionality of the sides of two similar triangles, that is, the ratio of any corresponding sides of similar triangles is the same regardless of the size of the triangles. 1. Determine the length of the missing side of the right triangle. 2. Mason wants to lay pavers in his families' backyard for the summer. It is important that he start the pavers at a right angle. If he want the dimensions of the patio to be 8 ft by 10 ft, what should the diagonal measure? The converse of the Pythagorean Theorem is also true. For any triangle with sides a, b, c, if a2 + b2 = c2, then the angle between a and b measures 90° and the triangle is a right triangle. How to use the Converse of the Pythagorean Theorem? We can use the converse of the Pythagorean Theorem to check whether a given triangle is an acute triangle, a right triangle or an obtuse triangle. 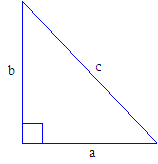 If c2 < a2 + b2 then it is an acute-angled triangle, i.e. the angle facing side c is an acute angle. If c2 = a2 + b2 then it is a right-angled triangle, i.e. the angle facing side c is a right angle. If c2> a2 + b2 then it is an obtuse-angled triangle, i.e. the angle facing side c is an obtuse angle. According to the triangle inequality theorem, the sum of the two shorter sides of a triangle must be greater that the longest side. Determine if the lengths represent the sides of an acute, right, or obtuse triangle if a triangle is possible. The Pythagorean Theorem can be used when we know the length of two sides of a right triangle and we need to get the length of the third side. Example 1: Find the length of the hypotenuse of a right triangle if the lengths of the other two sides are 3 inches and 4 inches. Answer: The length of the hypotenuse is 5 inches. Example 2: Find the length of one side of a right triangle if the length of the hypotenuse is 10 inches and the length of the other side is 9 inches. Answer: The length of the side is 4.36 inches. How to use the Pythagorean Theorem to solve real-world problems? 1. Claire wants to hang a banner from the sill of a second-story window in her house. She needs to find a ladder that, when rested against the outside wall of her house will be long enough to reach the second-story window. If the window is 16 feet above the ground and Claire places the foot of the ladder 12 feet from the wall, how long will the ladder need to be? 2. During a baseball game, the second baseman gets the ball and throws it to the catcher to stop a runner before he gets to home. If it is 90 feet between each base, how far did the second baseman throw the ball? 3. A water park wants to add a zipline into a pool. If the platform at the top of the zipline is 25 feet tall, and the pool is 40 feet ling, what is the maximum length needed for the zipline? 4. A wheelchair ramp is needed at the entrance to a building. There is only 10 feet of space available for the ramp. How long should the ramp be? 5. A television screen is advertised as 50 inches. If the television is 35 inches wide, how tall is it? 6. A kite at the end of a 40 feet line is 10 feet behind the runner. How high is the kite? 7. A roof is being placed on a frame that is 9 feet tall and 30 feet wide. How long are the diagonal pieces of the frame? There are many ways to proof the Pythagorean Theorem. We will look at three of them here. How to proof the Pythagorean Theorem using Similar Triangles? This proof is based on the fact that the ratio of any two corresponding sides of similar triangles is the same regardless of the size of the triangles. How to proof the Pythagorean Theorem using Algebra? In this proof, we use four copies of the right triangle, rearrange them and use algebra to proof the theorem. How to proof of the Pythagorean Theorem using Rearrangement of shapes? The following video shows how a square with area c2 can be cut up and rearranged such that it can fit into two other smaller squares with areas a2 and b2.